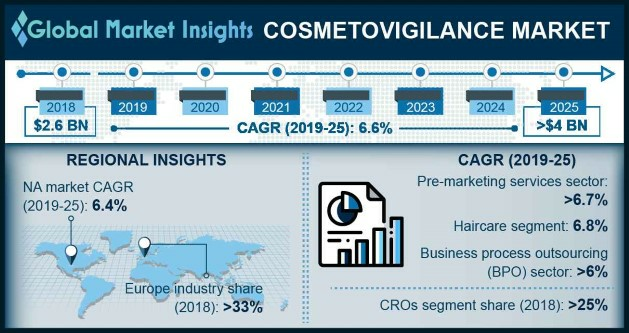 Cosmetovigilance Market size is set to exceed USD 4 billion by 2025; according to a new research report by Global Market Insights. Growing risk associated with use of cosmetic products is expected to drive cosmetovigilance industry growth throughout analysis period. Cosmetics such as skin brightening creams, moisturizers and skin ointments contain several chemical compounds that may not suit every individual and may generate certain type of skin reactions resulting in high demand for cosmetovigilance services. Besides, beauty products and shampoos can also cause skin irritations and rashes. Adverse events are reported against these conditions that proves beneficial for industry growth as it increases the demand for fixation of the condition. Technological advances in cosmetovigilance software will positively influence industry growth over the coming years. Recently developed cosmetovigilance software provide enhanced user interface and data integrity. Moreover, these software are highly reliable as they provide data security. Therefore, availability of advanced cosmetovigilance software should spur revenue size. However, lack of awareness regarding cosmetovigilance in developing and underdeveloped countries will hamper cosmetovigilance market growth in foreseeable future. Post-marketing services segment is anticipated to witness over 6% CAGR during forecast timeframe. Increasing number of adverse reactions reported against marketed cosmetic and other skin care products will drive segmental growth. The post-marketing surveillance of cosmetics using upgraded software has significantly reduced incidences of reactions and inflammations in individuals. Thus, above mentioned factors will stimulate the segmental growth in upcoming years. Skincare products segment is expected to have significant revenue share of more than 24% in 2018. Stupendous segmental revenue share is attributable to growing incidences of skin rashes and acne cosmetica. According to Mercola, around 13,000 chemicals are used in cosmetics and only 10% of them have been tested for safety. Hence, there have been cases where companies manufacturing cosmetics were sued by authorities such as U.S. FDA. Number of adverse events for personal care products surged to 1,600 in 2016. This scenario created hike in demand for technologically upgraded software that help in managing issues related to skincare products that should surge segmental growth. Contract research organizations (CROs) segment will experience over 7% CAGR during the forecast timeframe. Medium-size cosmetic product manufacturing companies prefer expertise of CROs that provides comprehensive solutions. Additionally, small size cosmetic products manufacturing companies do not have separate facility for carrying out the safety surveillance of products. Advanced cosmetovigilance system from CROs reduces the cost of setting up an entire unit and enables time management for the small-size companies thereby, fosters the segment growth. Europe cosmetovigilance market witnessed more than 33% revenue share in 2018 and is anticipated to grow exponentially over forecast timeframe. Positive regulatory framework supports Europe cosmetovigilance market growth. For instance, EU Commission implements certain guidelines for reporting cases against adverse events. Therefore, scenario in Europe is promising for new entrants willing to grab potential share in cosmetovigilance market as the laws and trade policies are favorable. Moreover, awareness regarding availability of technologically advanced cosmetovigilance system is considerably high that will prove beneficial for the regional industry growth. Some of the major business competitors operating in the cosmetovigilance industry includes Cliantha, PharSafer, FMD K&L, Freyr, OC Vigilance, MSL Solutions Providers, Poseidon CRO, Skill Pharma and ZEINCRO. These players have gathered enormous profits by harnessing available opportunities. Additionally, companies adopt several strategic initiatives such as mergers, acquisitions and new product launch to sustain intense competition. Also, regional regulatory authorities have framed regulations that favor development in cosmetovigilance industry. Companies such as MSL Solutions Providers and others comply with these regulations thus, minimizing the incidences of adverse events.